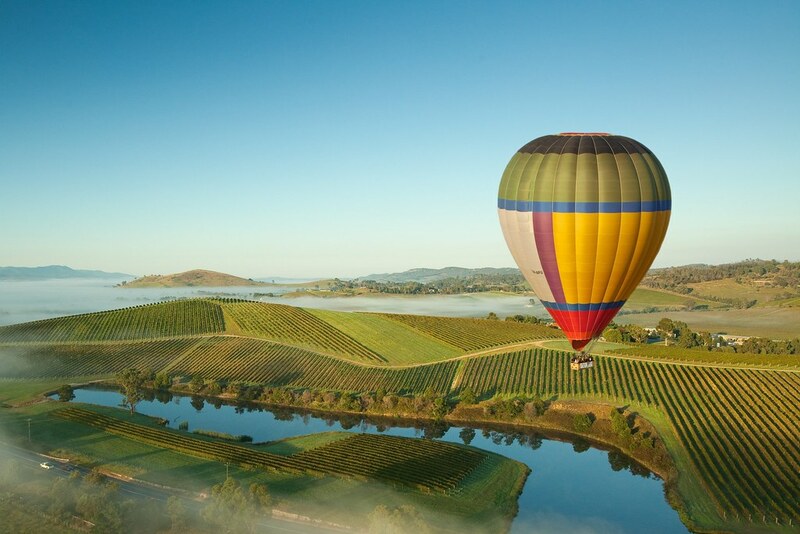 Autumn is a perfect time to visit the Yarra Valley and Dandenong Ranges. The summer heat has departed and the weather remains calm and cool. Less than an hour’s drive from Melbourne, the Yarra Valley vignerons open their cellar doors to some of Australia’s best wines. The Autumn months are very busy for winemakers as the grapes ripen ready for harvest or what the wine markers call ‘Vintage’ commencing in late February for early ripening varieties such as Chardonnay and Pinot Noir, and continuing through to May. There are more than 70 cellar doors to explore including big brand wineries such as Domaine Chandon, Balgownie Estate, Rochford, De Bortoli and Oakridge and many boutique wineries with stories to share. Cider and ale makers are also blazing a trail with seven breweries and cider makers. The colours of the valley turn to gold and red of oaks, elms and chestnuts. It’s the perfect time to take flight on a hot air balloon or a leisurely stroll through any of the regions parks and gardens. The Healesville Sanctuary is busy with the scurry of baby feet as many of the wildlife give birth in the cooler months. Autumn is also the season of ripeness for the fruit orchards. The summer sun has worked its magic and fruit trees hang heavy with lush produce. It’s a busy time for apple pickers in the Warburton Valley and there are many fruit stalls along the highway offering the freshest of produce. Autumn is the best time to enjoy the colours of the Dandenong Ranges. It’s right on Melbourne’s doorstep, but feels like a world away with scenic winding roads to quaint hilltop villages, Mountain Ash forests and cool-climate gardens. Take a walk through the National Rhododendron Gardens and see maples and cherry trees ablaze with autumn hues. Walk through the tranquil woodland garden of Pirianda Garden, see the golden colours of maples, beeches and gingkos at the Alfred Nicholas Gardens or the liquidambers and maples along a range of walking tracks at R J Hamer Arboretum. Tread quietly and you may come across a lyrebird impersonating the sounds of the rain forest at Sherbrooke. Experience the breathtaking view of Melbourne from Skyhigh Mt Dandenong, feed the birds at Grants picnic ground, take a ride on the famous Puffing Billy Steam Train or soar through the trees at Trees Adventure. Kick through autumn leaves, explore the charming hilltop villages and snuggle up by a log fire for an idyllic escape.